Sometimes everything perfectly aligns. I finished this piece right around 5pm when the light was stunning and golden. The dresser was begging to be photographed immediately! Normally I give it a day, let the wax cure, and slowly style the furniture until it suits me. BUT THAT NATURAL LIGHT! So in a fit of madness, I started running around the house grabbing art to hang on the wall, and random bits to style the top with. I normally hang an odd number of pieces on the wall, but this set of four worked well and I liked how the large colorful painting was balanced out with the three smaller paintings in more neutral tones. When styling, I [almost] always hang art first and then take look at my giant bookcase of styling props. This time my row of vintage books caught my eye. I noticed how nicely all their colors paired with the large painting I had hung, and grabbed the whole lot. I quickly shoved them on the top, had that AHA! moment and continued grabbing a few more items to complete the vignette. There was so much color in the books, I kept the rest neutral with a cream ceramic lamp [Pottery Barn], my little brass mama duck and her ducklings [vintage from Highland Row Antiques] and a tall clay vase [West Elm]. Something about this set up really resonates with me. 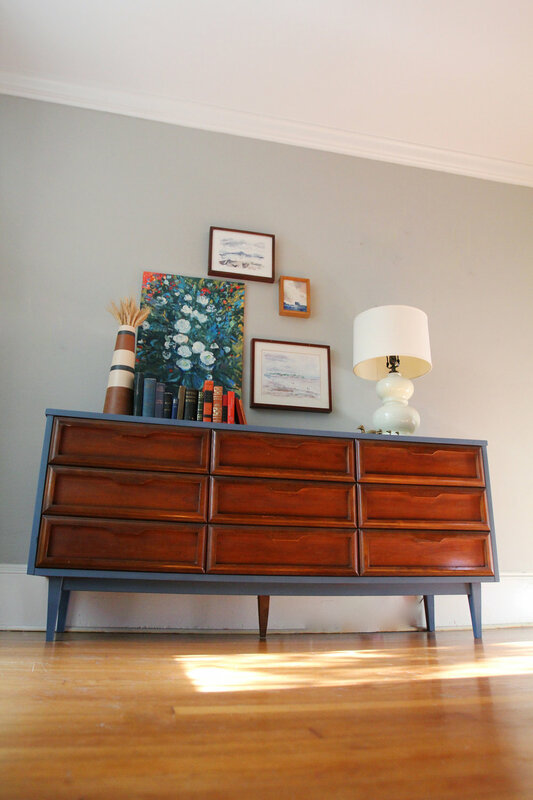 Mid century pieces are so timeless and simple, it really doesn't take much to make photos of them shine. But between the art and the books in that rainbow of shades, I'm simply in love. For my painting readers, I created the blue-gray finish on the frame using a combination of Annie Sloan's Aubusson Blue and French Linen. The mixture created the perfect neutral with a bit of a twist. The color works with warm accents or cool, whichever mood you're in. I don't know why, but something about these photos and this styling makes me think of 'back to school' time. I've only just put this up for sale in my shop, but I'm secretly hoping I get to hold onto it for a bit so I can do another restyle of this piece using actual school props [notebooks and yellow pencils and rulers oh my!]. I loved school as a kid, so this time of year and the color tones found in this photoshoot really just give me the warm and fuzzies! When it comes to furniture, my work doesn't stop once I've finished painting. Getting each piece ready to photograph and sell takes a bit of styling and creativity. I like to mix things up and keep the styling props I use fresh and unique each time. Sometimes I'll experiment with different vignettes until I find one I'm really happy with. For this piece, I had a hard time deciding, so I thought I'd share all three! I started off with the most colorful grouping. I always like to start with what I put on the wall since that's what often grounds the vignette. I decided on a gigantic vintage map for this first photo. 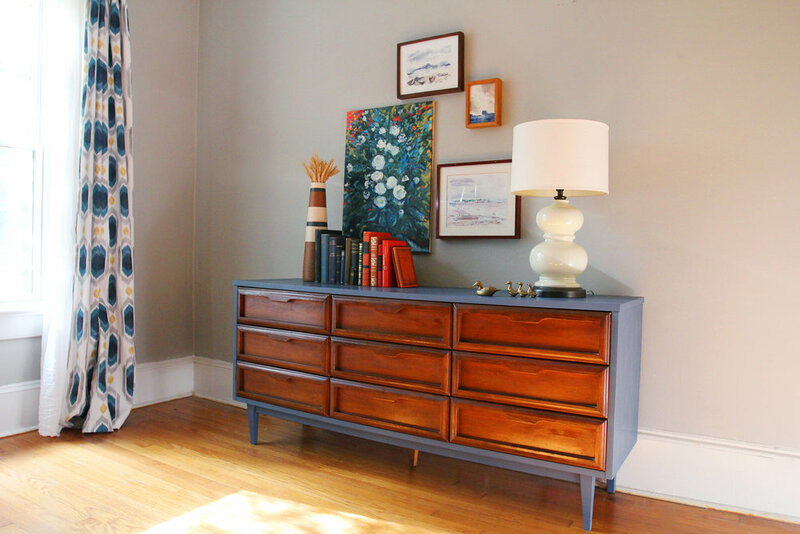 The bright colors contrasted beautifully against the cocoa-gray dresser. Because the map was so busy, I kept the objects on the dresser simple, using a large potted plant, a stack of books that pick up some of the colors in the map, and a framed magazine cutout. I decided to play up the more traditional colors of the dresser by going with warm toned objects with a slightly masculine feel. I balanced the framed map with two vintage prints. I love hanging in odd numbers whenever possible. It always seems to be more pleasing to the eye this way! 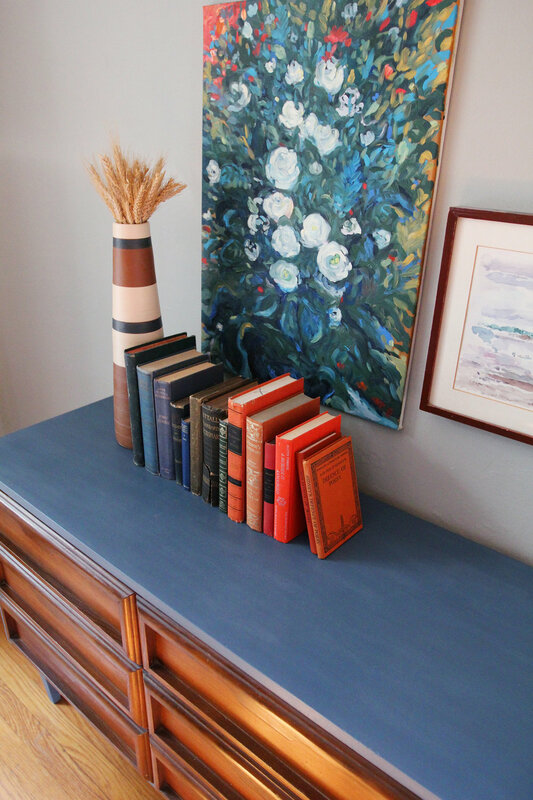 On the left, I added in a weighty industrial metal lamp, a few vintage books, and some tiny pottery I picked up at my neighborhood's festival the other week. On the right I went with my trio of vases from Steven Allen for West Elm. Lastly, I was inspired by the colors from a painting done by my aunt. The painting in question is a small one on the bottom left that appears to be of a tornado on the water [the series this is a part of are all abstracts so I can't actually say this is a tornado, but you get the gist!]. The mixture of a taupe-gray, light pink and murky blue really intrigued me. I grabbed items from around the house in these colors, along with a few white and natural accents to make the grouping feel even more modern. I don't normally style dressers with pillows, but this one I just picked up from Society 6 had just the right shade of blush pink, and the circular detail on it tied in with my map of Atlanta. It's not everyday I give people a tour of my bathroom, but since I did tidy it up for these photos, I thought why not share it? The rest of the bathrooms in the house are quite small, so having a space with a large shower, a separate tub and a sizable vanity has been a dream! I've never been a big bath taker, and honestly I really haven't used this beautiful claw foot tub nearly as much as I should, but for Christmas I got some deliciously scented bath bombs from Lush, so I'm making a point to take more baths and some 'treat yo-self' time! Everything in this bathroom is in shades of blue and faint green and it really feels so spa like. The tile I used in the entire bathroom was surprisingly affordable [from The Tile Shop], but looks SO luxurious! I love spending time getting ready in here before going out since it feels like I'm in my own little boutique hotel! With the styling of things, I kept everything very natural and simple. I love my wispy little air plant tucked into a shell beside my bath. The small shelves I had put into the tile are perfect for setting down my coffee in the morning [or a glass of wine at night!]. On the bathroom countertop, I try to keep things minimal. For the shoot, I did a few succulents, shells and ceramics, but most of the time I just keep my hair and cleansing products here. On the other side of the countertop are some of my perfumes, and a little vintage dish with my rings. I don't wear much jewelry [really I have the same necklace and the same couple pairs of earrings on at all times!] but I do love my rings. Tinkerbell occasionally makes an appearance in my bathroom! The less pretty, but more practical part of my bathroom are these built in shelves tucked behind the shower. Here I have baskets with necessities like toilet paper, my makeup bags, and my jewelry [again, most of which I don't even wear...really need to up my jewelry wearing game I suppose!]. My makeup vanity is the most coveted spot in this room, and I can't say enough how much I love having a dedicated spot for all my makeup! Just beside the shower I have a spot to hang my towels. Styling again was simple with a paper flower [love love love my Amaranthus Paper & Flora!] in a vase. It was tricky to get a proper photo of my shower, since the glass door reflects everything! [as glass does] I have all my shower necessities tucked into custom sized shelves [another must do if you ever have the chance to to a bathroom renovation!]. My bathroom is weirdly one of my favorite spots in the house. It's a departure from my typical design style, but I like that it feels like a bit of a getaway for me! Next we'll move our way into the 'guest suite,' which is definitely a departure in style!